This is an oldie but goodie from the archives — my apologies for the less than stellar photo from 2010! These cookies are chewy, crackly, and bursting with sesame flavor. I was known as “The Cookie Fairy” in grad school for good reason — these are completely irresistible to anyone who likes sesame-flavored anything. Enjoy! I am definitely more of a cook than a baker. It’s not that I don’t bake things, or that they don’t come out well — most of the time my oven produces pretty tasty treats. It’s just that baking is such a different process from cooking. Cooking is dynamic, often improvisational. You can tweak things as you go. Baking, on the other hand, is an act of faith. It requires that you assemble your recipe, then shove it in the oven and trust in science and luck to ensure an end product worth eating. Now, you can simply follow a well-reviewed recipe to bake well, but then you’ll never learn what separates your baking successes from your failures. It’s more useful to figure out what ratios work best, and even more so, what successful recipes look like before they are baked, both on paper and as an unbaked dough. An experienced baker can eyeball a recipe and ascertain what the dough should look and feel like once it is assembled. This skill takes cultivating, and in a way, requires you to bake like a cook, making decisions and improvising on the fly. Granted you must be precise in your measurements, but it also pays to be flexible enough to change a recipe if it seems to need some tweaking. For instance, if your dough is so dry it is unstirrable, your recipe probably needs a little more moisture. If your cookie batter is pourable, it most likely needs more flour. 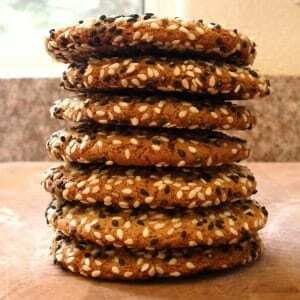 By my estimation, this recipe for sesame cookies needs no such modifications. I shared them with my friends yesterday, and they were a universal hit — everyone loved the chewy and crunchy texture and hit-you-over-the-head sesame flavor. I employed a four-pronged sesame strategy, using tahini, toasted sesame oil, and two types of sesame seeds. Whole wheat pastry flour keeps things nice and wholesome, while a touch of rice flour helps the cookies get nice and crisp. Plenty of dark brown sugar gives them an addictive chew, and a roll in sesame seeds adds texture, flavor, and really pretties things up. 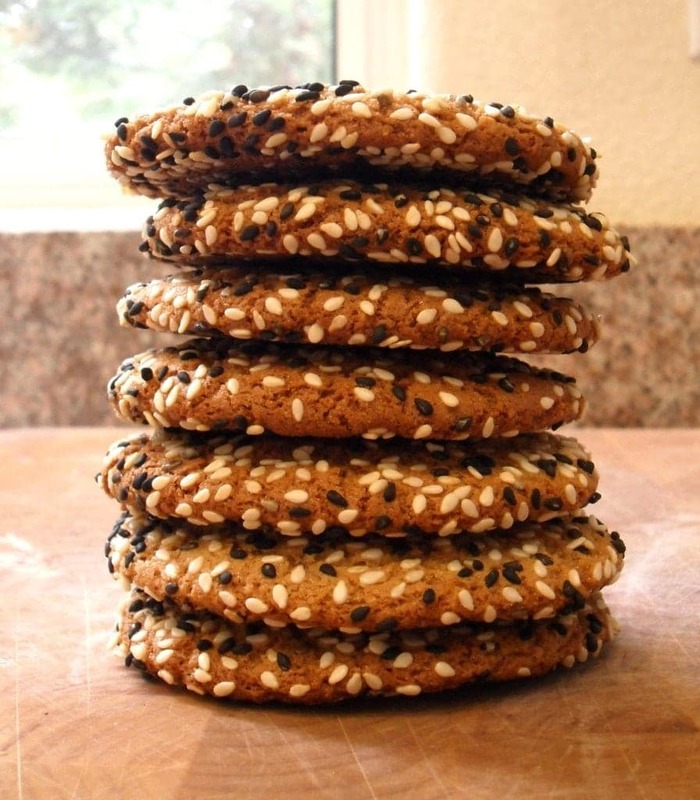 If you are as big of a sesame fan as I am, I implore you to put on your baker hat and make a batch of these right away. Chewy, almost candy-like cookies with an over-the-top sesame flavor. In a medium mixing bowl, combine the brown sugar, tahini, and toasted sesame oil, stirring well until all lumps are dissolved. Add the agave syrup, vanilla and egg, to the bowl and stir until smooth. Add the whole wheat pastry flour, rice flour, baking powder, baking soda, and salt. Stir until dry ingredients are thoroughly incorporated. Preheat oven to 375ºF and line two baking sheets with parchment paper. Place the sesame seeds in a small bowl. Mix to combine the colors evenly. Dab some vegetable oil on the palms of your hands, then roll the cookie dough into 1 Tbsp. balls, then roll them in the sesame seeds. Press the cookies onto the cookie sheets, flattening slightly. Bake for 10 minutes, or until lightly browned. Cool on cookie sheets for 2 minutes, then move to cooling racks.